Another installment into the neighbourhoods of Chicago and its surrounding areas. 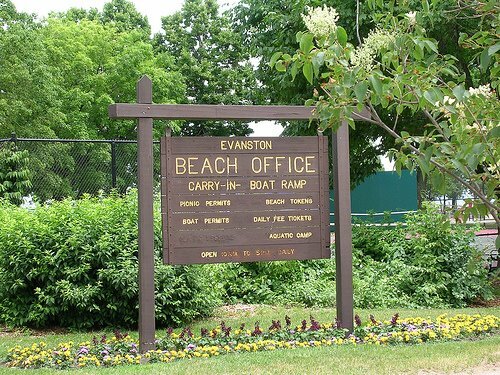 Evanston is not actually in Chicago, its 20 miles north of the city sat snug on Lake Michigan but during the summer I took the purple line train (about 40 minutes) up there to explore one of the most expensive commuter belt areas in the state. 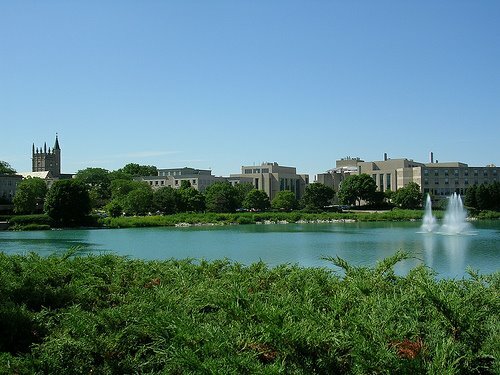 The beautiful campus grounds nestle up to Lake Michigan, the university actually came first in 1851, with Evanston growing up around it afterwards later in the century. 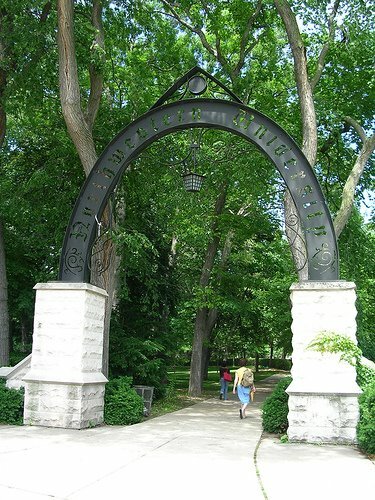 Northwestern is consistently highly ranked for its law, arts and medical schools as well as the famed Kellogg School of Management. 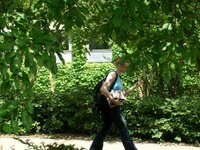 ‘The Wildcats’ also excel in basketball and American football and play in the Big Ten Conference, the smallest college in the conference. Famed graduates include Charlton Heston, David Schwimmer, Jerry Reinsdorf (owner of Chicago Bulls and White Sox) and Hugh Hefner, whilst Cindy Crawford flunked, oh well I guess she had other attributes? The main part of Evanston spreads itself a few blocks in from the lakefront, with beautiful houses situated the few blocks nearest to Lake Michigan, the houses getting bigger and grander the closer you get to the water. 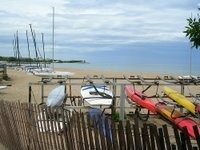 The beaches are sandy with volleyball nets and parkland being divided by pedestrian walkways and bicycle lanes. 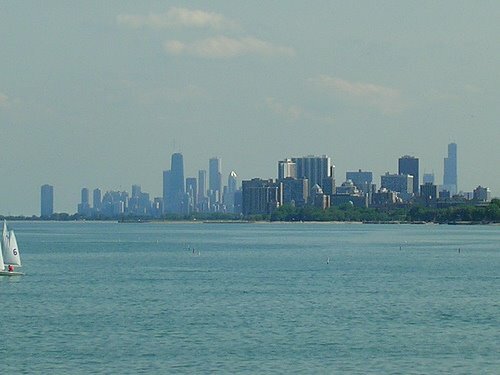 Further north Northwestern University has it’s monopoly with some wonderful views looking south along the lakefront back to the Chicago skyline. The main shopping area has some familiar signage to it with the obvious names and touristy places are more common than shops selling anything original. Café’s and bars are plentiful and there is a nice restaurant scene, with Oceanique (505 Main St) one of the best. Open spaces proliferate, with 75 parks in the town plus 5 sandy swimming beaches. The Gross Point Lighthouse is situated in a park near the lake. Although most people come here for the countryside and the lakefront there is an eminent theatre scene with The Piven Theatre one of the more well known ones. Began by the parents of actor Jeremy Piven of Entourage fame, the theatre is nationally acclaimed for its acting school and forms part of the Noyes Cultural Center (927 Noyes Street). The Evanston Historical Society, the magnificent chateau looking mansion of for mer U.S. vice-president Charles Gates Dawes shares with visitors the history of Evanston (225 Greenwood St), whereas the American Toby Jug Museum (910 Chicago Ave) displays 6,000 erm, jugs, not surprisingly the largest collection in the world. 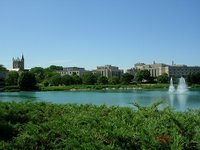 Beyond Evanston are the highly desirable and commutable towns of Winnetka, Lake Forest and Kenilworth, where the houses get bigger and so do the prices. 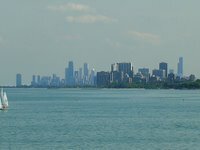 However, if you are in a car a drive along the lakefront and through some of the best countryside in Illinois is well worth a diversion.